October 1, 2018 — When Joseph Martin returned home to New York after five years as a military police officer in the Army, including a 13-month tour in Afghanistan, the married father of four didn't know where his next paycheck would come from. For the first few months, he suffered from culture shock and post-traumatic stress disorder. A frequent chess player, Martin relied on his strategic skills to plot the next steps in his life. 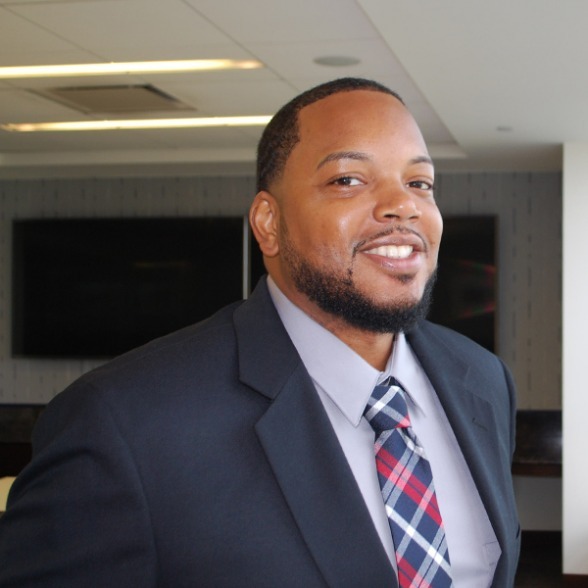 He ultimately enrolled in Baruch College, where he learned about Hughes Hubbard's Veteran Internship Program, an educational initiative that helps veterans transition from military service to the civilian workforce. Martin is now working in HHR's finance department as the sole intern in the firm's third class of veterans, an eight-week program that concludes at the end of October. The program offers qualifying veterans competitive part-time pay, invaluable work experience and a variety of networking opportunities. "This is great. I like the people and the knowledge they have to offer," Martin said. "I volunteer for a lot of things, but this is my first foot in the door in Corporate America." Bob McGowan, the firm's chief financial officer and a retired Army officer, initiated the program at Hughes Hubbard in October 2015 after launching it in the London and Boston offices of his prior firm, Edwards Wildman Palmer, a legacy firm to Locke Lord. McGowan was inspired by media company TiVo's veteran intern program, which began in 2012. McGowan thought a law firm was the perfect workplace to civilianize veterans. "We have all these back-office functions," he said. "We have a tremendous amount of people that have great contacts because you don't get to be a law firm partner unless you're a black belt in networking." HHR's first class of interns -- two Air Force veterans and one Navy veteran -- were all students at Pace University. Last year's class featured two Marine veterans -- one from Baruch College and the other from Pace University. Martin is the first Army veteran to participate in HHR's program. Martin is interning in HHR's financial department until the end of October. "His resume was interesting and when we met him it was very clear that he would be ideal," McGowan said. "He is just the kind of young man you want to help." Martin, 33, grew up in the Flatbush section of Brooklyn and played football in high school. After getting married and having two kids, he decided to follow in the footsteps of his uncle and late father, who served in the Marines. Martin joined the Army in 2009 and spent his first three years in Hawaii. While in Hawaii, he was sent to Afghanistan, where firefights and grenade attacks on his armored vehicle put his life in jeopardy. "There were some challenging times when I thought I wasn't going to make it home," he recalled. Martin's military experience taught him to appreciate everything in life. "I just like to enjoy life because I know we could be here today and gone tomorrow," he said. Martin now lives in the Bronx with his wife and four children -- two sons ages 15 and 5, and two daughters ages 13 and 7. After spending a year in the reserves, he enrolled in Baruch College to study real estate investments. Martin heard about HHR's program through John Ly, a Marine veteran who served in last year's internship. When Martin graduates in June, he plans to pursue his MBA and teach financial literacy to inner-city children. He's also considering getting a law degree. But no matter where he ends up professionally, he won't forget his experience at Hughes Hubbard. "I'm very grateful to be here," he said. "Veterans need programs like this."